On this ceramic tile tools page. 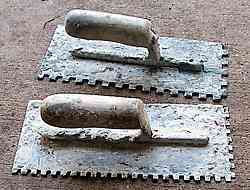 Ceramic tile tools - A couple of notched trowels. The tile adhesive has to be well mixed, to the correct consistency. You can of course mix it by hand with a paddle like stick. This is a slow process, and if you are only doing small amounts quite OK.
For larger mixes, more often, it is common to use a large slow revving electric drill with a mixer, for mixing the tile adhesives. Slow revving with plenty of torque. The stuff gets hard to spin around at the right consistency. This one happens to have a right angle attachment, but normally they are standard drills, usually "D" handled. Faster revving drills are not recommended as they tend to mix air into the adhesive. For mixing in general, always follow the instructions on the product. In most case I've seen they recommend that you mix it, leave it for a period for the water to be fully absorbed into the product, and then use it. You will need a few trowels, I like a brickies trowel with the point cut off for cleaning the pail out etc. Then of course the all important notched trowels for spreading the adhesive to a consistent thickness. The depth and size of the notch determines just how much adhesive is used. We may have smaller notches for wall tiles, than floor tiles. Above on the left is a 100mm grinder with a smooth diamond blade. A pair of tiler's nips, which are used for breaking off and trimming small pieces. In this shot I have prepared a couple of tiles for fitting around bathroom taps. I mark the tile, front and back with a water base marking pen (easy clean off) and cut from the the back with the grinder, tapping out the center and trimming off with the snips. In this case the holes were a touch too small for the proper snips, so I used needle nosed pliers to trim for a fit. A quick note about fitting around tap/faucet fittings. You must allow enough clearance for the plumber's box spanner, for changing tap washers etc. Ceramic tile tools - A simple glass cutter will cut many tiles. At the most basic, the simplest way to cut a ceramic tile is by scoring the glazed face of a tile with a glass cutter. Using a straight edge or a square held firmly on the tile, a straight scratch mark or score is made on the surface. A small piece of material is placed under the score, and hand pressure is applied the either side of the tile. If the score was done correctly then the tile will snap along the score mark. A tip when using glass cutters, for glass or ceramic, have a small container of kerosene or other such light oil, and dip the tip of cutter into it every few cuts. This seems to make for better cuts. Either by just cleaning it of lubrication, I don't really know, but it works. 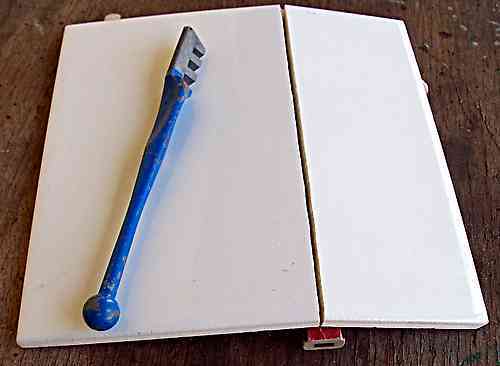 Ceramic tile tools - A tile cut with a cheap glass cutter. In the image above I placed a carpenter's pencil under the the tile. Say I wanted to cut only 20mm off the edge of the tile. 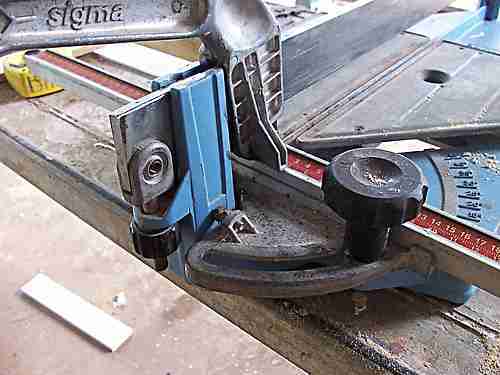 I would score the surface with the cutter, and then hold the tile down firmly with with my left hand with the bit to be cut off overhanging the edge of my bench. With my right hand I would snap the tile at the mark with a pair of nips or pliers. If you look at the glass cutter, the notches in the side of it are for doing the same thing with different thicknesses of glass. As the piece to be cut off gets smaller, I take smaller bites out of it with the nips. 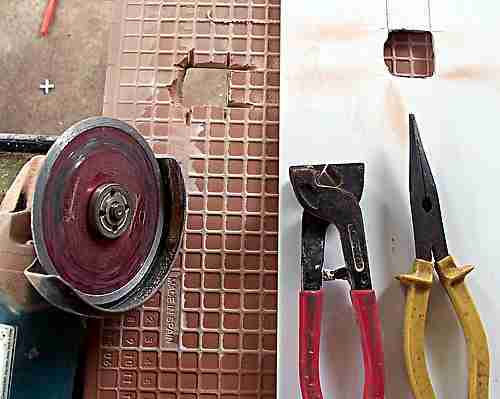 It is quite possible to do small tiling jobs with no other tool for cutting the tiles. Typical splash back jobs only have a few cuts. Ceramic tile tools - Sigma, single bar type score cutter. 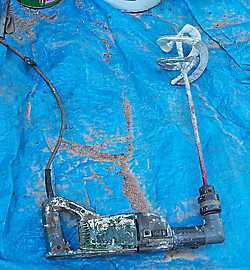 Above is a shot of a Sigma tile cutter. This cuts the tiles the same way as the glass cutter but with a lot more certainty, ease and speed. The principal is the same though, score the tile at the correct position, and then apply force to either side of the cut and snap the tile. Ceramic tile tools - Sigma, close up. 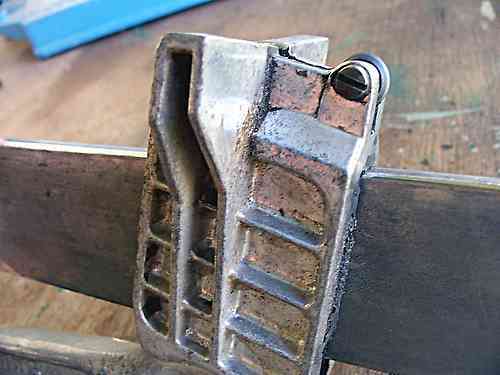 Here is a shot of the working end of the handle, (Upside down here,I took the bar off the machine for the photo) and you can see the hardened cutting disk that scribes the cut when the handle is raised, and the vee shaped arms that apply pressure to each side of the cut when the handle is depressed, for snapping the tile. Ceramic tile tools - Sigma, detail. Here's another detail. The advantages of this type of cutter are fairly obvious, here are a few points. The bar holding the handle/cutter/breaker is very solid and fixed firmly to the body of the machine. It is adjustable for height, the knurled knobs under it at each end are spring loaded. When setting up it is common to see a tiler take a fair amount of time, to get the height just right, by cutting quite a few tiles until he is happy with the action. Directly under the cutting bar is a solid fixed bar, that supports the tile directly under the cut. (It does the same job as my pencil in the photo 4 above). The cutting disk is easily replaceable, but they will cut hundreds of normal tiles before they need changing. 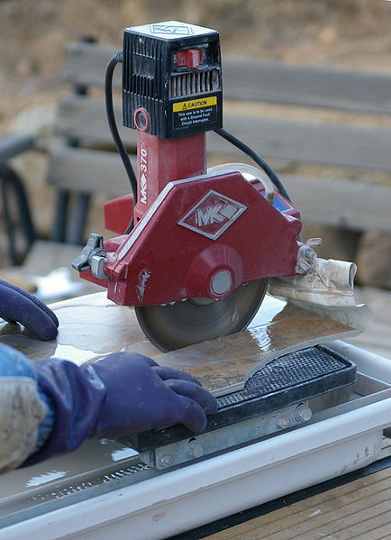 With harder glazes and textured surfaces the cutting disk will need replacing more often. On either side of the cutting bar the tables are firm, but spring loaded, so that they allow the snapping action of the breaker. The fence is adjustable for square and angled cuts. It has metric and imperial scales on it. In the photo (3 above), (just in front of that universal accessory the cup of coffee), there is a "U" shaped gizmo that is a fence stop. It is clamped on the fence, and makes it easy to cut many pieces exactly the same length. 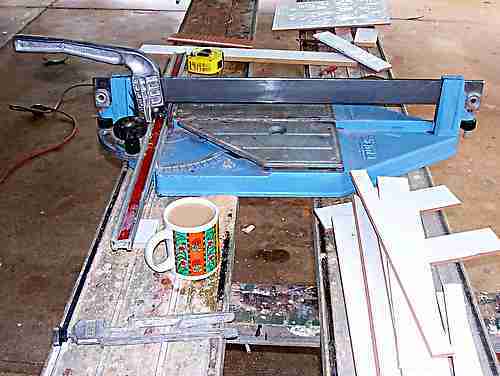 Another method of cutting tiles is by using a bench mounted wet saw. These machines are getting more common these days. Not because they are quicker and easier to use than a Sigma type cutter, but because of the tiles that need cutting. Many of the tiles on the market today like stone, fully vitrified porcelain tiles, and some clay tiles are extremely hard or difficult to cut with a score cutter. The wet diamond blade cuts them easily. The saws have an adjustable fence type setup for accurate and repeatable cuts. They cost more to buy and the replacements blades are dearer. They are dirty, noisy and heavier than a score cutter. But at the end of the day the job has to be done and if score cutters can't handle the job then a wet saw is the only option left. << BACK: Ceramic Tiles, setting out.